The Congress workers said that they slaughtered the cow to protest the beef ban. In Kerala and many other states, beef is consumed by the Hindu populace. 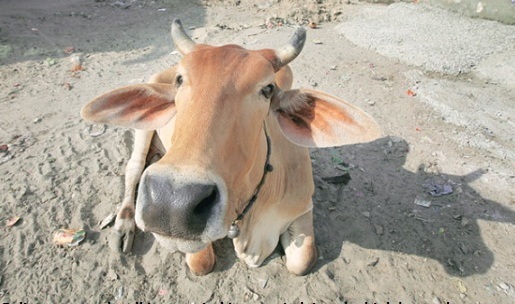 Though in North Indian states, it is illegal and there are strict laws against cow slaughter. BJP-RSS stand on beef keeps changing, depending on party's poll prospects in a state. It changes from region to region, leader to leader. There is no clarity. They speak in a different voice in North India and a different voice in South, North East, Eastern India and states like Goa. Principally, BJP is against beef consumption as it feels it is against nation's thous though the most indigenous tribal have been beef eaters. On one hand, BJP's Hindu leaders have repeatedly said that they have no problem with beef, its Muslim face Mukhtar Abbas Naqvi had said that the beef eaters should be sent to Pakistan. 2. Muslims avoid beef because the Hindu majority considers cow as a holy animal. Mostly, it is the Hindu populace in different parts of the country--South, East, North Eastern States and Tribal regions, that consume beef. 3. In Goa, where BJP has been the ruling party, beef is not banned. In North Eastern states, BJP has openly said that it is not against beef. In Kerala, its leaders have offered 'quality beef' in case they are elected. 4. Union minister Kiran Rijiju had said that he consumed beef and no one can force their dietary preferences on him. 5. Even, RSS leaders who went to North East, said that a person who consumes beef could join the Sangh. Still, right-wing groups use the issue of 'beef' to target Muslims. Muslims do eat buffalo meat, which is wrongly termed 'beef' in English media. Unfortunately, Muslims are nowhere in picture, they respect laws and even the sentiments of the Hindus, yet, they remain on target. When it comes to cow vigilantism, the Muslims are targeted. Laws are applied in such a manner that a person is booked even if he is not carrying beef--as the sample would be tested later. Even an armyman's father, Akhlaq, was murdered over a 'suspicion that there was beef in the fridge of his house'.